Ryerson University Library & Archives » News » News » Ryerson University Library and Archives (RULA) welcomes Congress attendees! Ryerson University Library and Archives (RULA) welcomes Congress attendees! Ryerson University Library and Archives (RULA) would like to WELCOME Congress attendees and invite attendees to visit The RULA Showcase. Time: 11 a.m. – 1:00 p.m. The RULA Showcase will highlight current special projects and research by library staff and faculty, with one project highlighted daily. Topics include open textbooks, computational textiles, digital exhibitions, and librarian liaison roles. 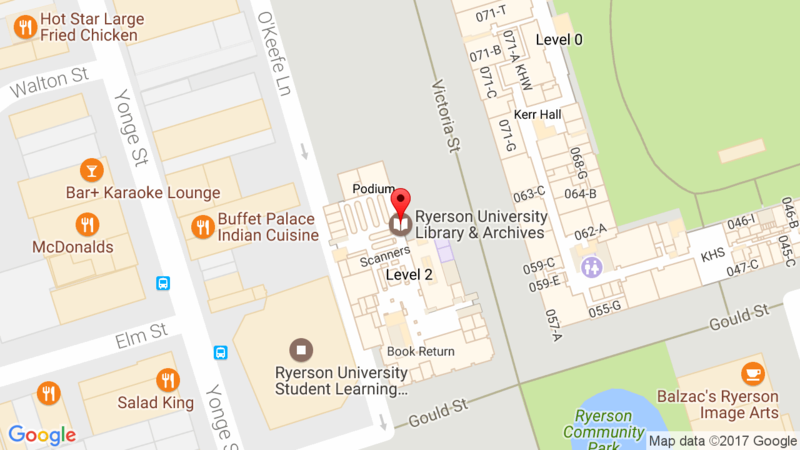 Drop by during lunch and see what’s new at the Ryerson Library. Learn more about Ryerson’s online publishing infrastructure project with eCampusOntario designed to enhance and expand eCampusOntario’s planned Open Textbook Library of 180 open textbooks. Knit Happens! is an informal program designed to build on the makerspace activities in the DME lab and introduce different forms of making. It provides a venue for students and staff to engage in creative projects that draw expertise from across disciplines while fostering diversity in both gender and interests. The Library is reviewing its liaison model, which refers to the assignment of a subject librarian to a specific program or department. Learn why this project was initiated, its goals and objectives, and a project status update. Remembering the Real Winnie: The World’s Most Famous Bear Turns 100 is a collaborative, interdisciplinary project that focuses on a unique chapter of Canadian history from WWI. It is based on the Colebourn Family Archives, a collection of photographs, diaries, images, books, and objects, which has been lent to Ryerson University for the purposes of this project. The Exhibit (November 5 – December 7, 2014), held in the Ryerson Image Centre focused on the role of photography within the archive while the collection websites presents the complete contents of the collection along with browsable diaries, dynamic maps, and manipulatable 3D objects. This poster presents the Library’s contributions to this project.